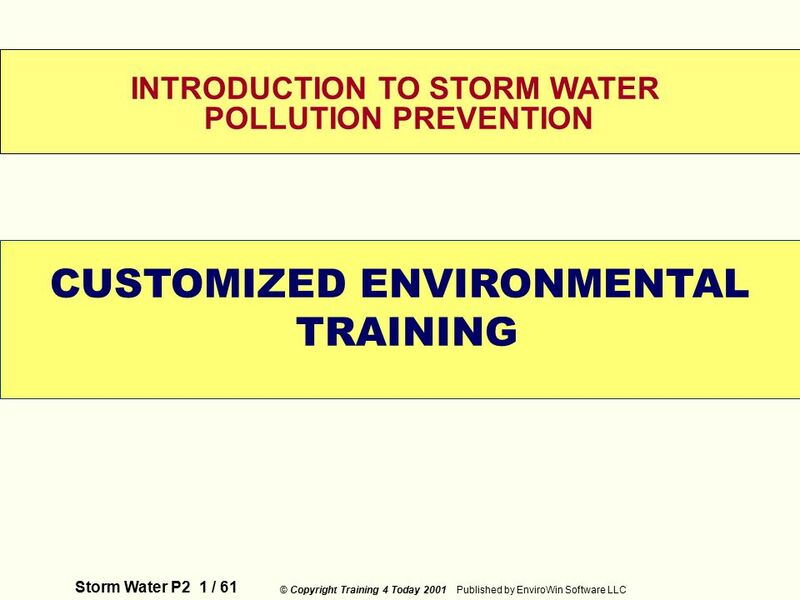 Storm Water P2 1 / 61 © Copyright Training 4 Today 2001 Published by EnviroWin Software LLC WELCOME INTRODUCTION TO STORM WATER POLLUTION PREVENTION CUSTOMIZED. 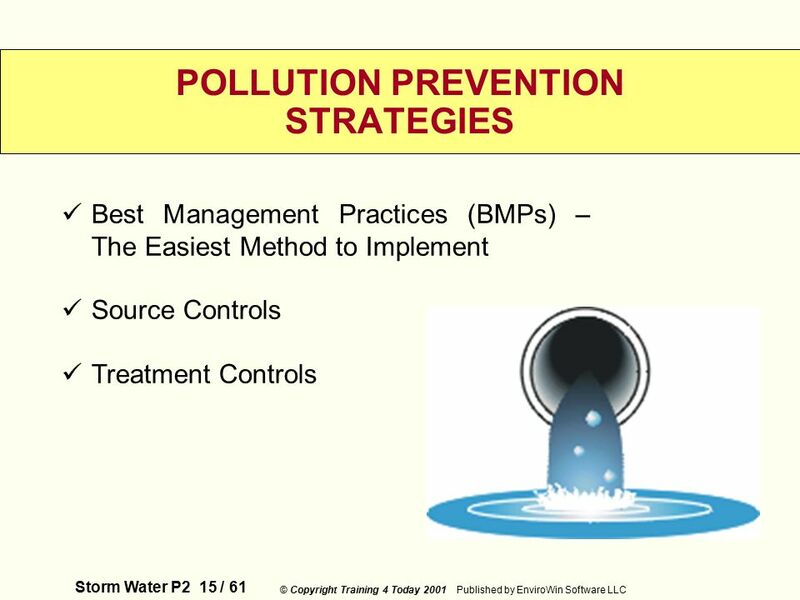 5 Storm Water P2 5 / 61 © Copyright Training 4 Today 2001 Published by EnviroWin Software LLC BACKGROUND  Storm water discharges are often the #1 source of ocean, bay, lake, and river pollution in the U.S.  It is estimated that storm water contributes as much as 80 percent of the total water pollution in the U.S.  One quart of oil can contaminate 250,000 gallons of water. 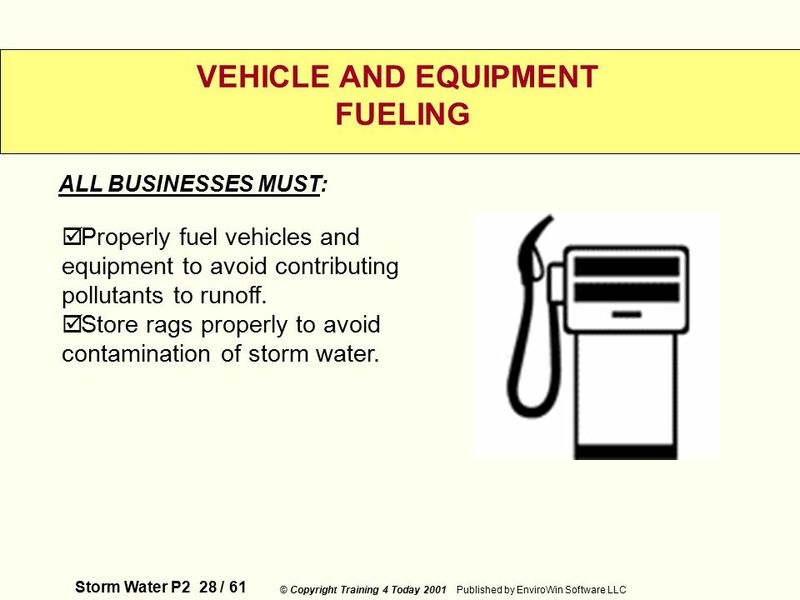  One pint of motor oil can produce an oil slick one acre in size. 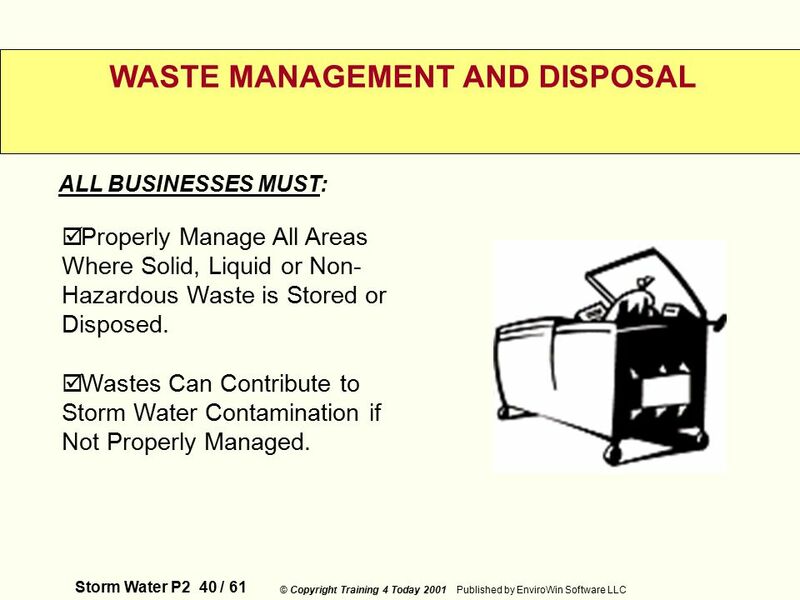 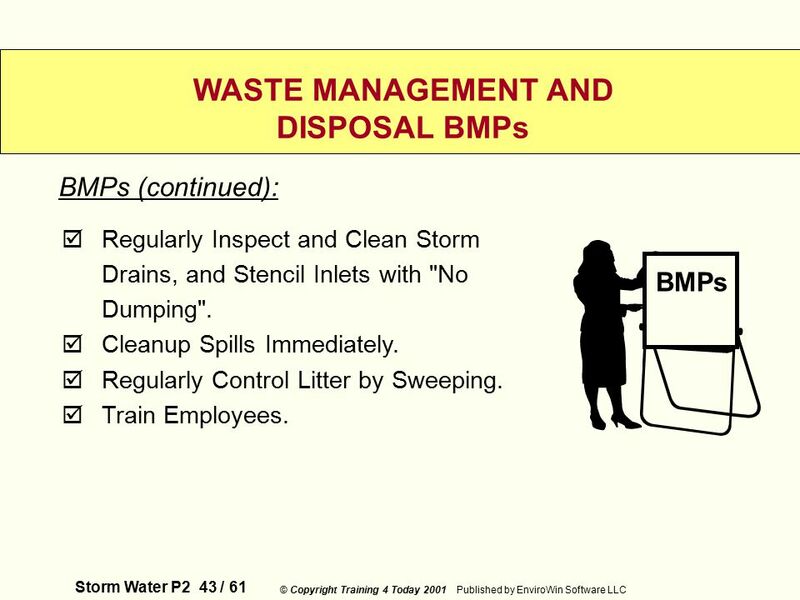  This training helps improve environmental compliance with the Clean Waster Act. 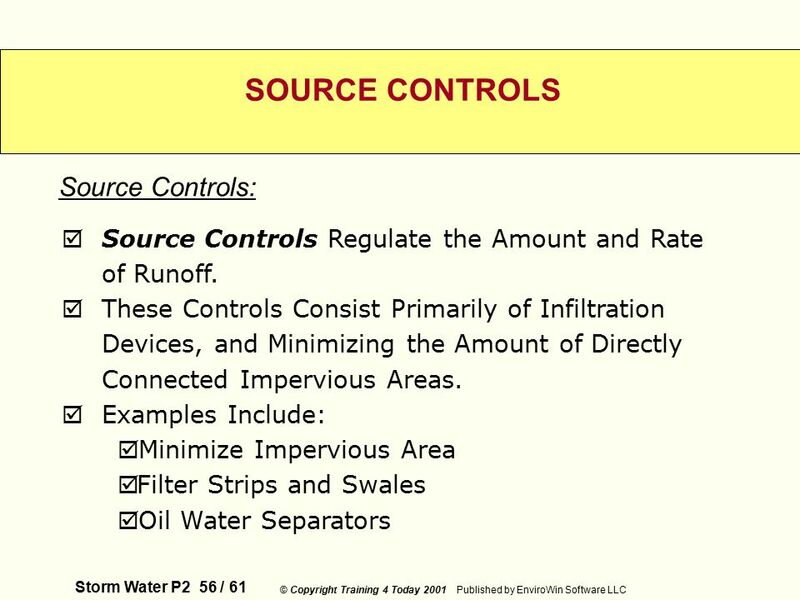 8 Storm Water P2 8 / 61 © Copyright Training 4 Today 2001 Published by EnviroWin Software LLC WHAT THIS COURSE DOES NOT DO The course is not intended to provide in-depth training in the technical aspects of water treatment, product substitution or land use management. 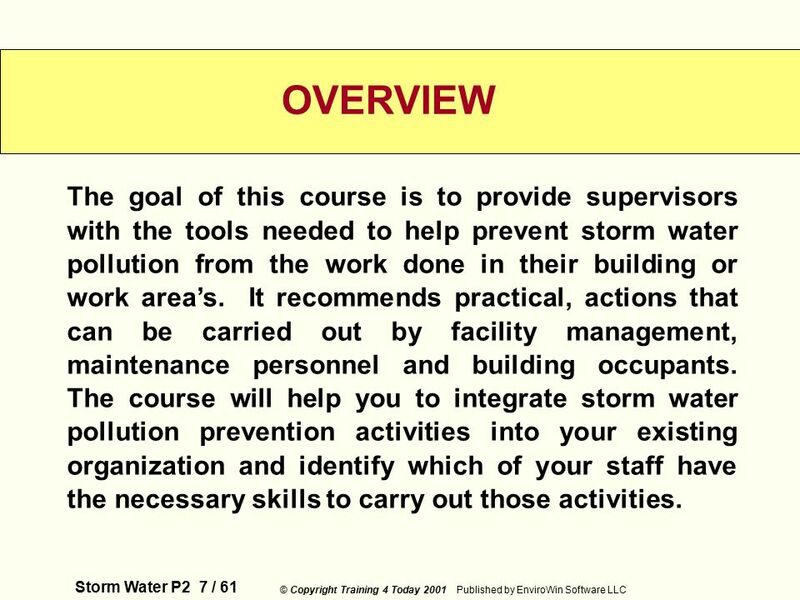 These specialties required training beyond the intended scope of this course. 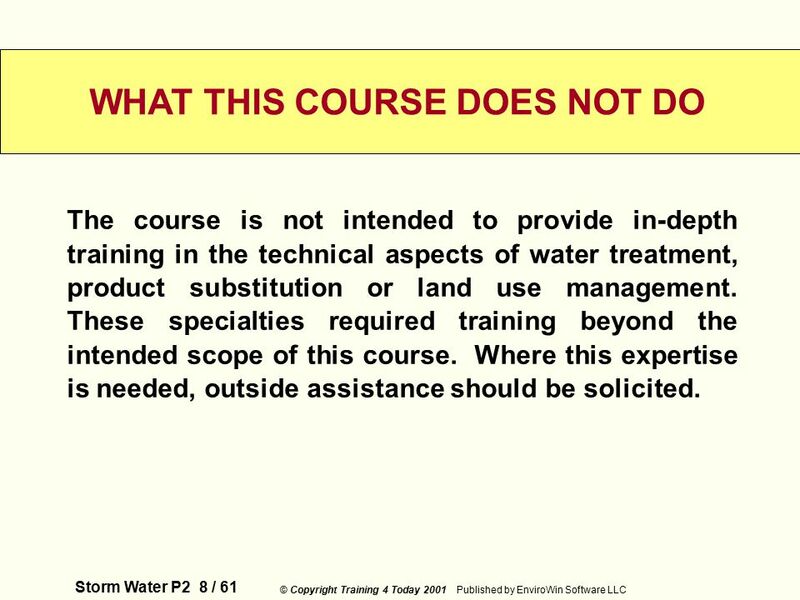 Where this expertise is needed, outside assistance should be solicited. 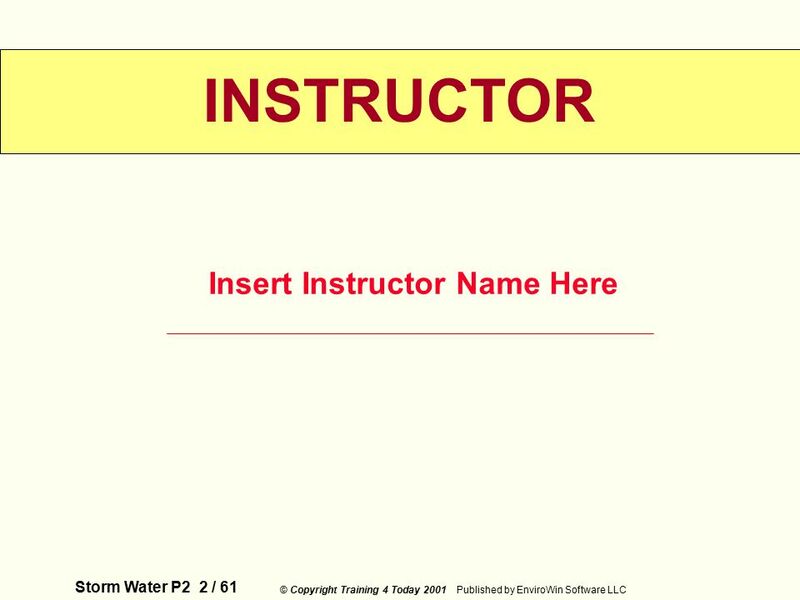 9 Storm Water P2 9 / 61 © Copyright Training 4 Today 2001 Published by EnviroWin Software LLC WHAT IS STORM WATER? 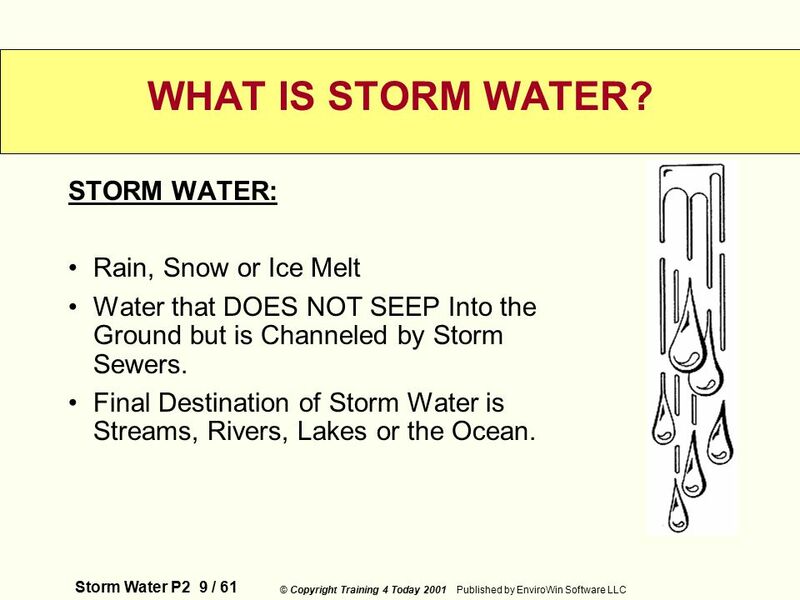 STORM WATER: Rain, Snow or Ice Melt Water that DOES NOT SEEP Into the Ground but is Channeled by Storm Sewers. 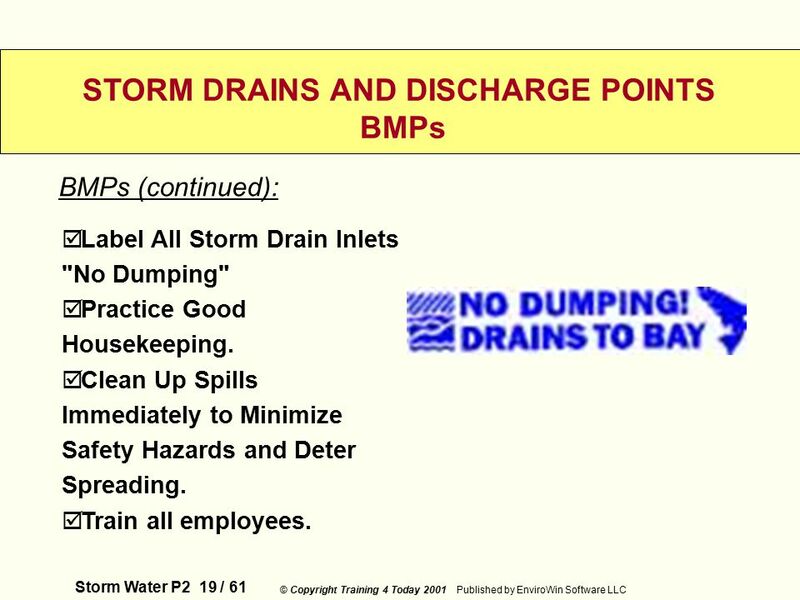 Final Destination of Storm Water is Streams, Rivers, Lakes or the Ocean. 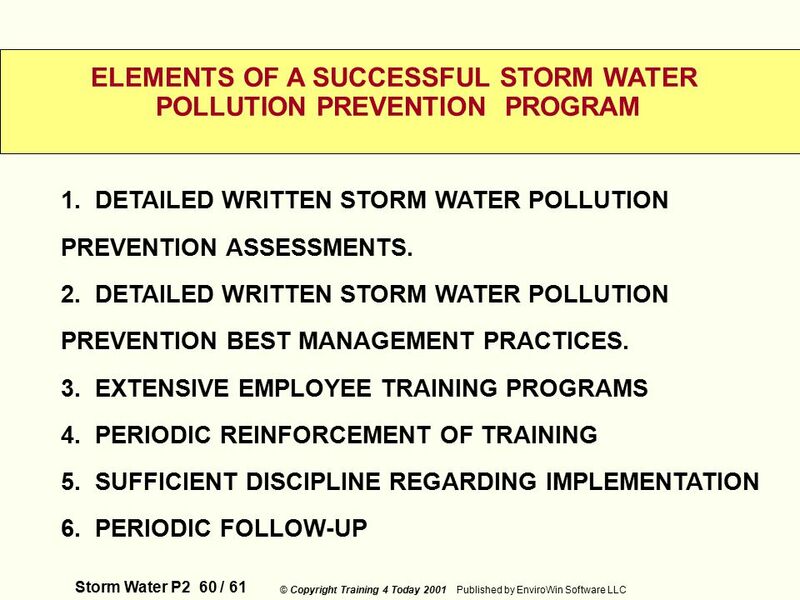 10 Storm Water P2 10 / 61 © Copyright Training 4 Today 2001 Published by EnviroWin Software LLC WHAT CAUSES STORM WATER POLLUTION? 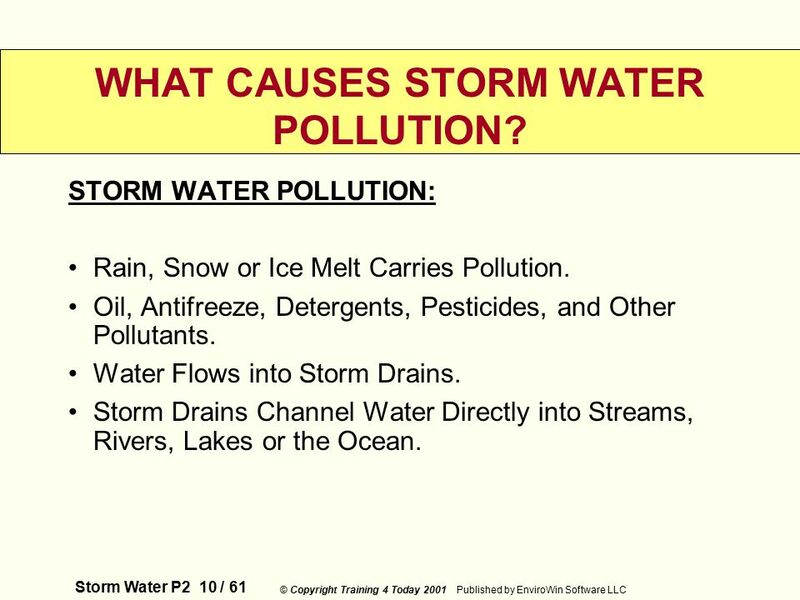 STORM WATER POLLUTION: Rain, Snow or Ice Melt Carries Pollution. 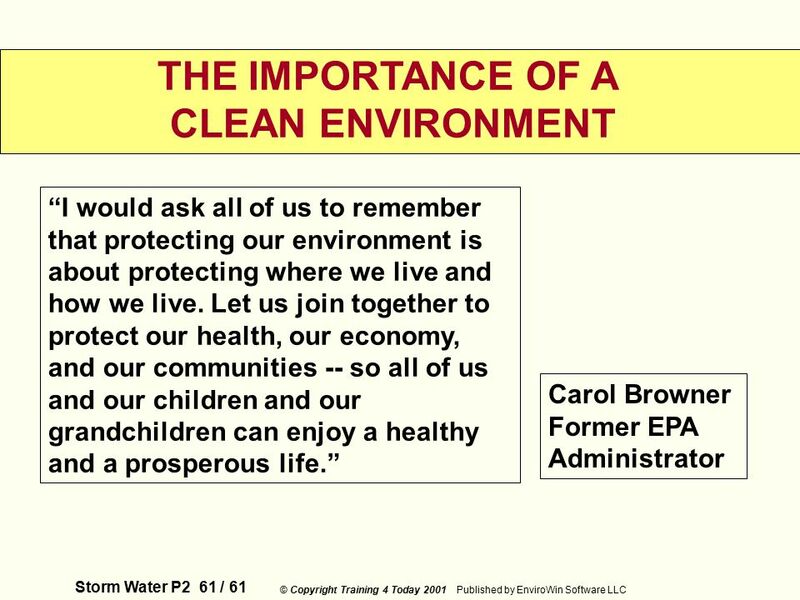 Oil, Antifreeze, Detergents, Pesticides, and Other Pollutants. 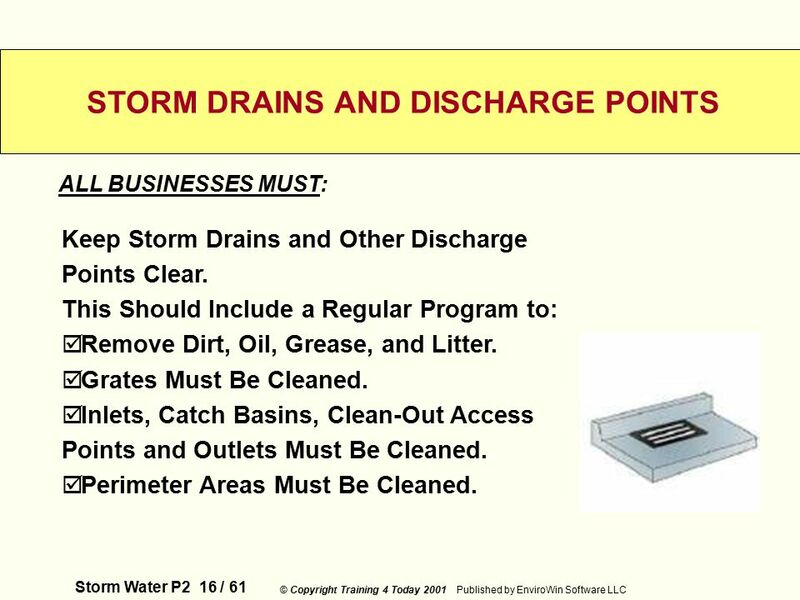 Water Flows into Storm Drains. 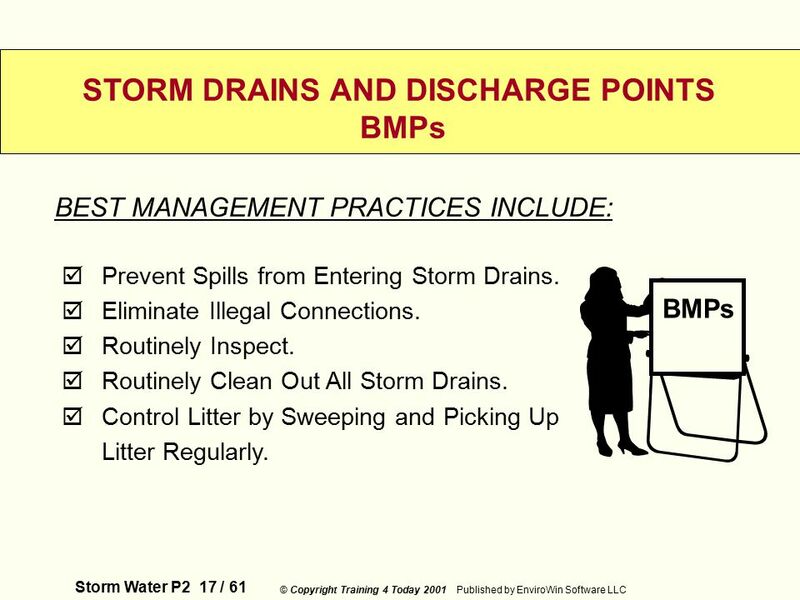 Storm Drains Channel Water Directly into Streams, Rivers, Lakes or the Ocean. 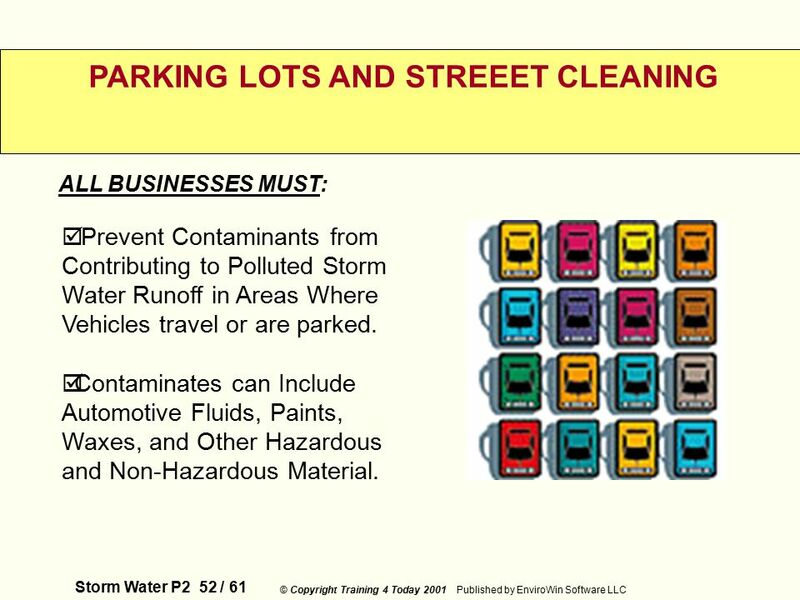 11 Storm Water P2 11 / 61 © Copyright Training 4 Today 2001 Published by EnviroWin Software LLC STORM DRAINS STORM DRAINS: Found Near Businesses, Homes and Street Corners. 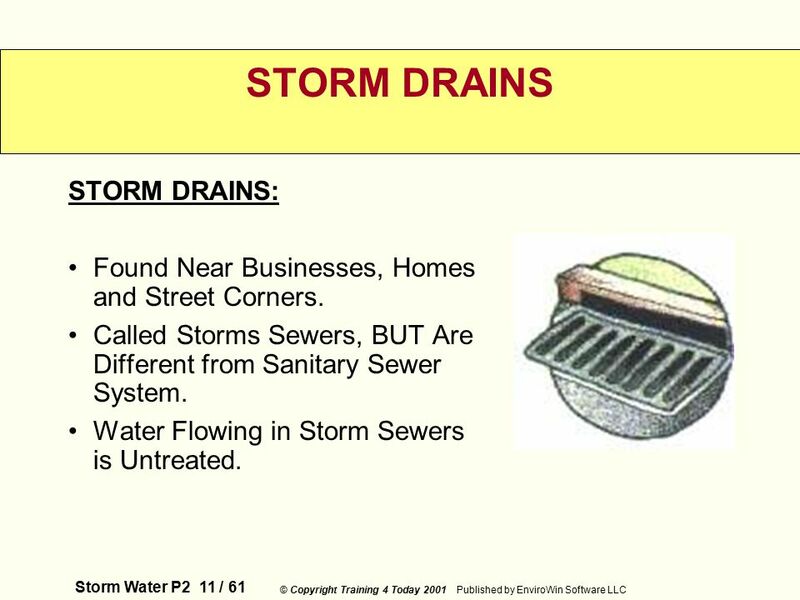 Called Storms Sewers, BUT Are Different from Sanitary Sewer System. 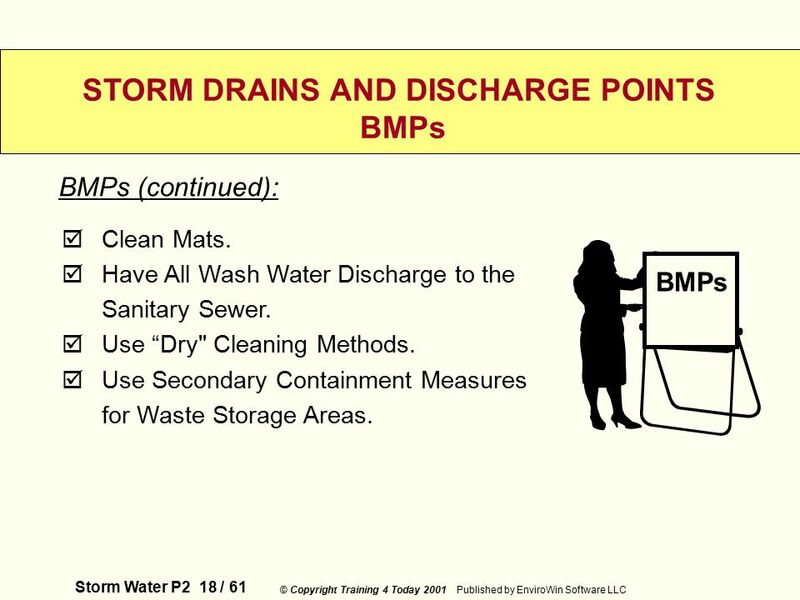 Water Flowing in Storm Sewers is Untreated. 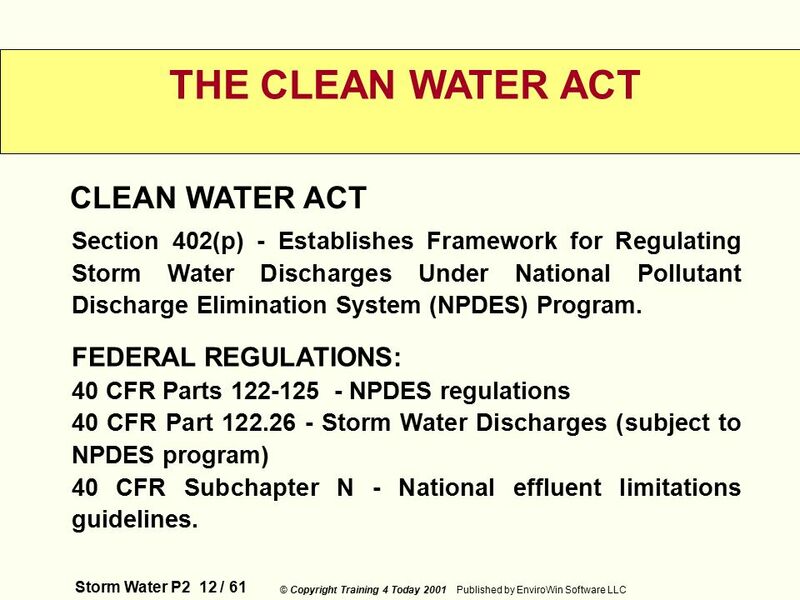 12 Storm Water P2 12 / 61 © Copyright Training 4 Today 2001 Published by EnviroWin Software LLC THE CLEAN WATER ACT CLEAN WATER ACT Section 402(p) - Establishes Framework for Regulating Storm Water Discharges Under National Pollutant Discharge Elimination System (NPDES) Program. 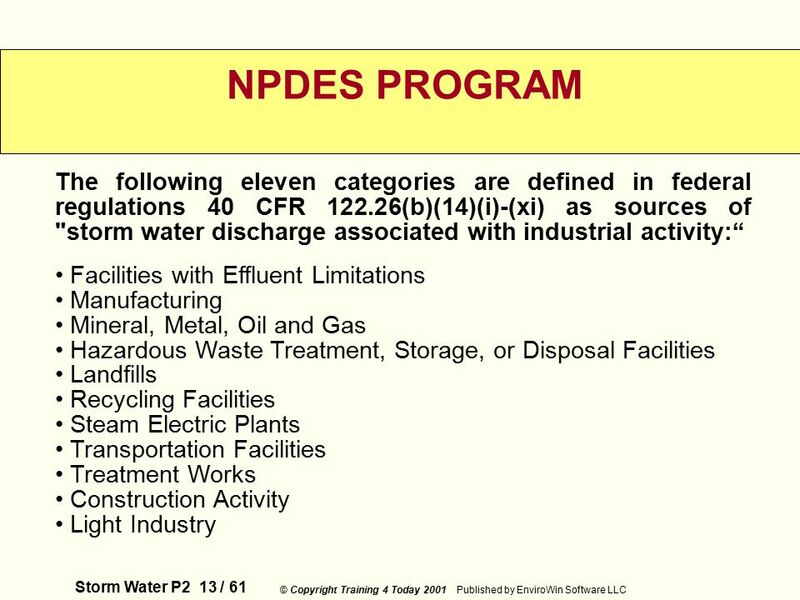 FEDERAL REGULATIONS: 40 CFR Parts 122-125 - NPDES regulations 40 CFR Part 122.26 - Storm Water Discharges (subject to NPDES program) 40 CFR Subchapter N - National effluent limitations guidelines. 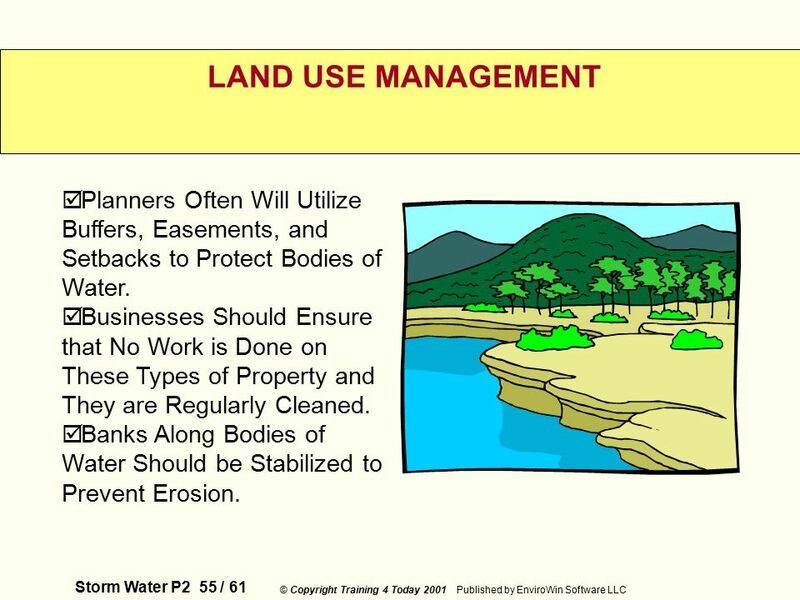 55 Storm Water P2 55 / 61 © Copyright Training 4 Today 2001 Published by EnviroWin Software LLC LAND USE MANAGEMENT  Planners Often Will Utilize Buffers, Easements, and Setbacks to Protect Bodies of Water. 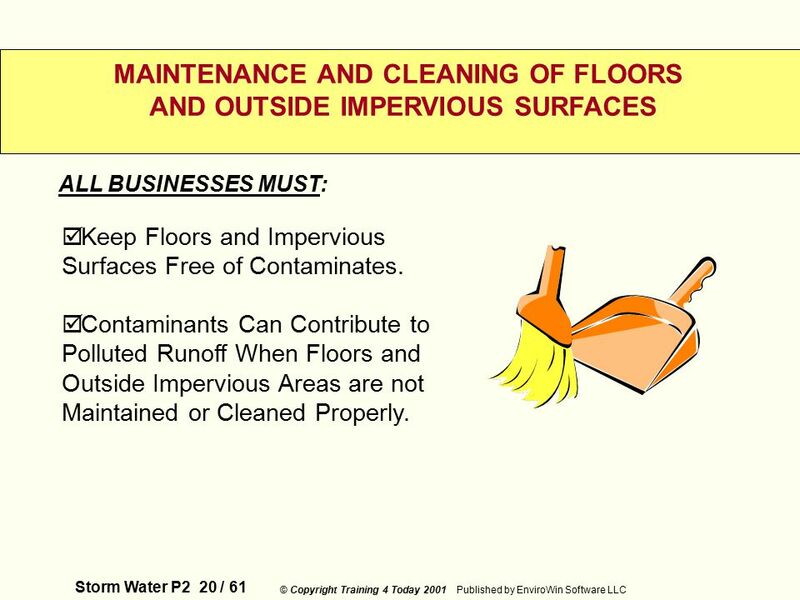  Businesses Should Ensure that No Work is Done on These Types of Property and They are Regularly Cleaned. 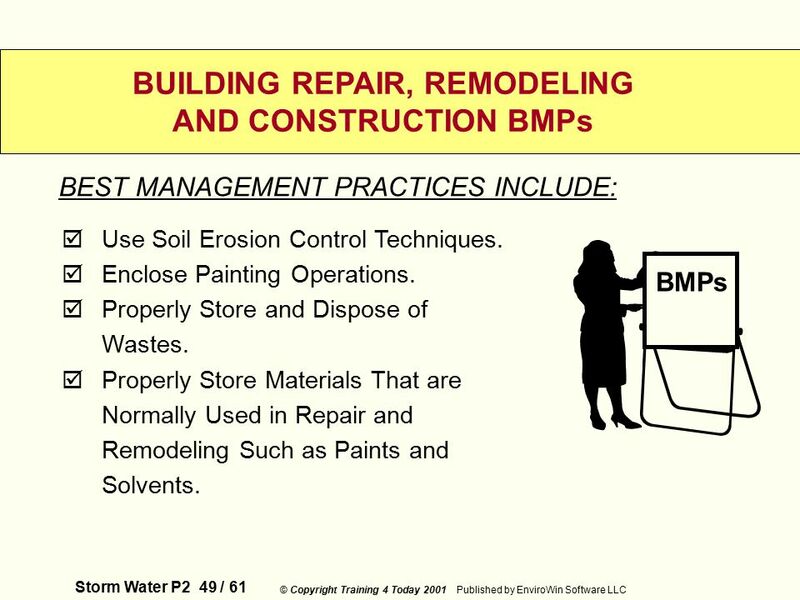  Banks Along Bodies of Water Should be Stabilized to Prevent Erosion. 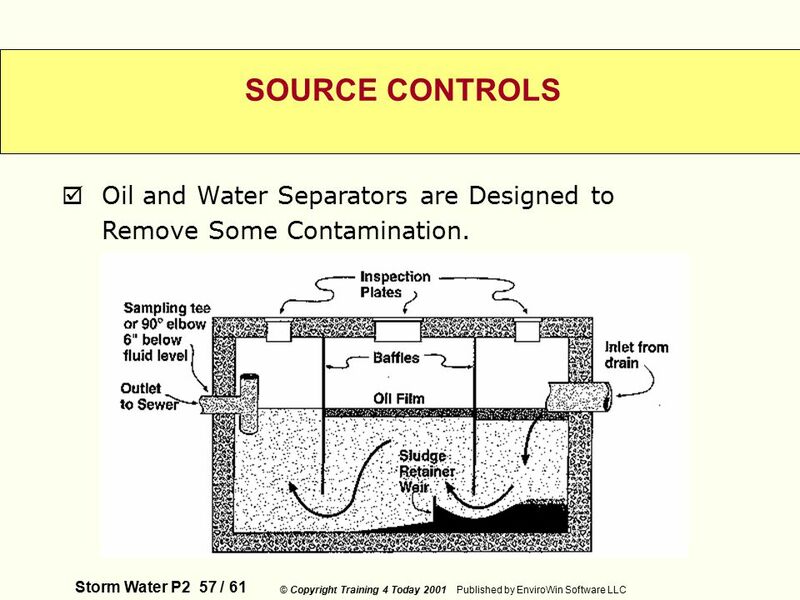 57 Storm Water P2 57 / 61 © Copyright Training 4 Today 2001 Published by EnviroWin Software LLC SOURCE CONTROLS  Oil and Water Separators are Designed to Remove Some Contamination. 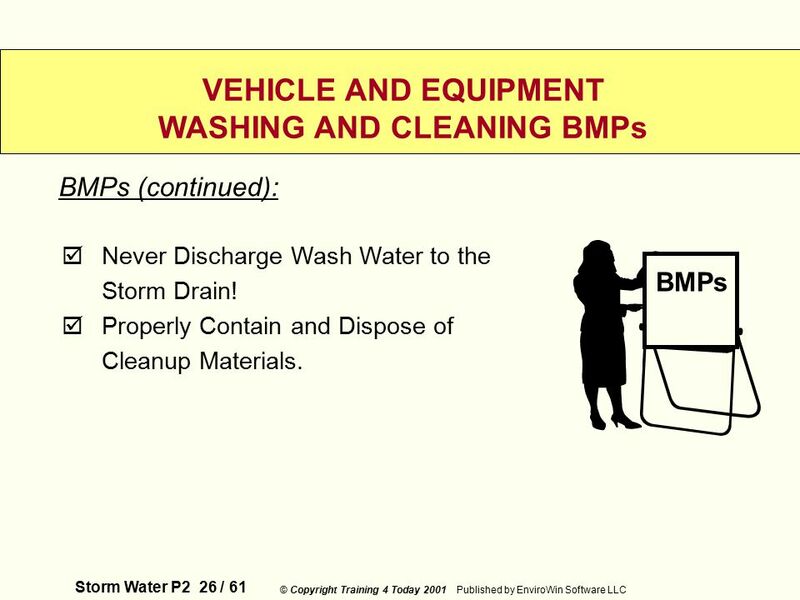 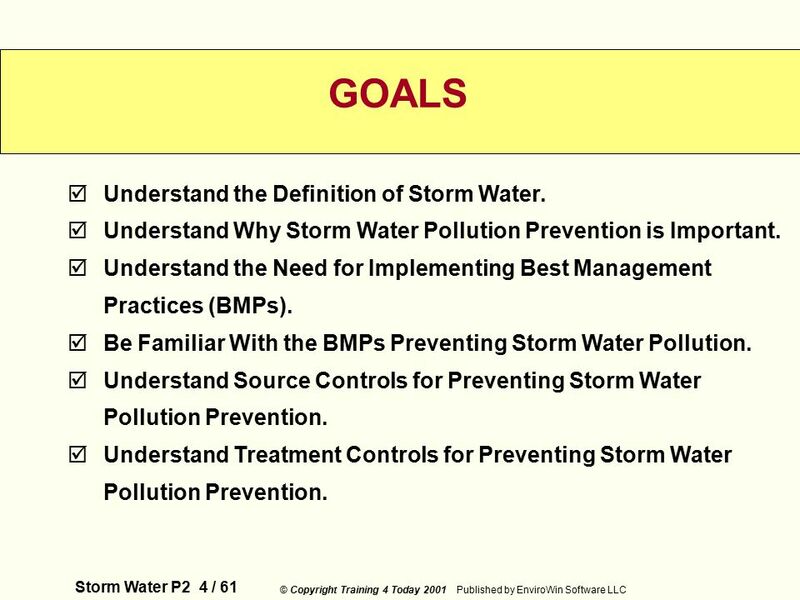 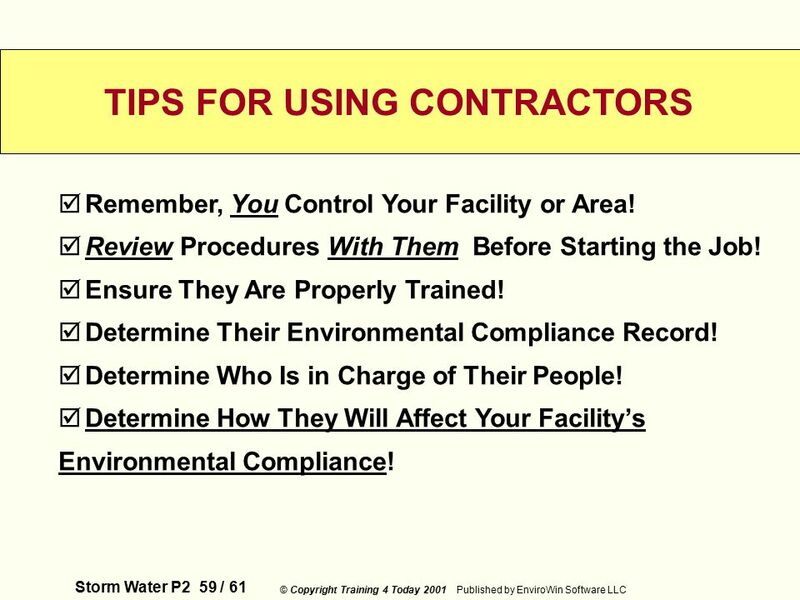 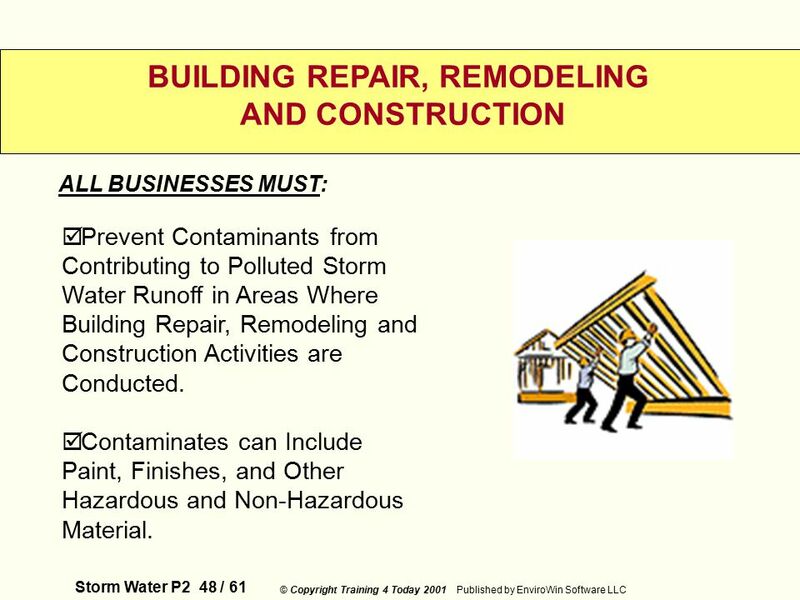 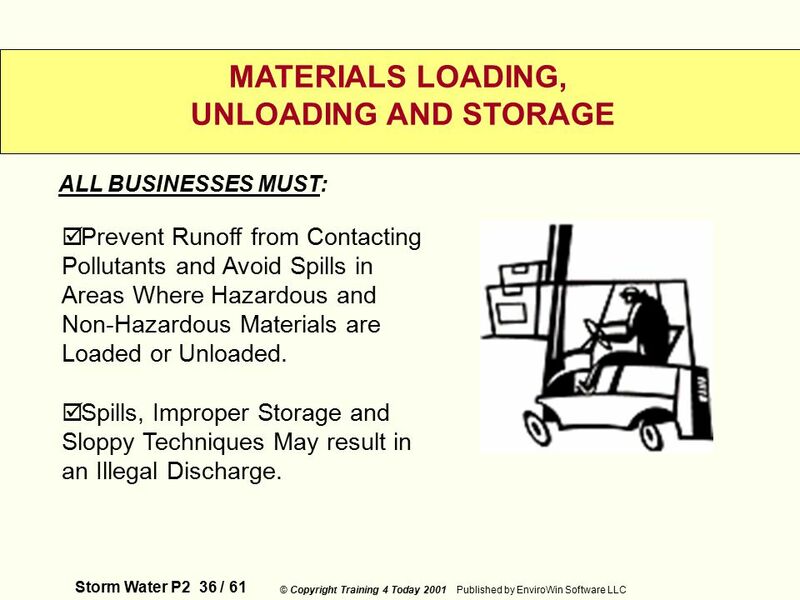 Download ppt "Storm Water P2 1 / 61 © Copyright Training 4 Today 2001 Published by EnviroWin Software LLC WELCOME INTRODUCTION TO STORM WATER POLLUTION PREVENTION CUSTOMIZED." 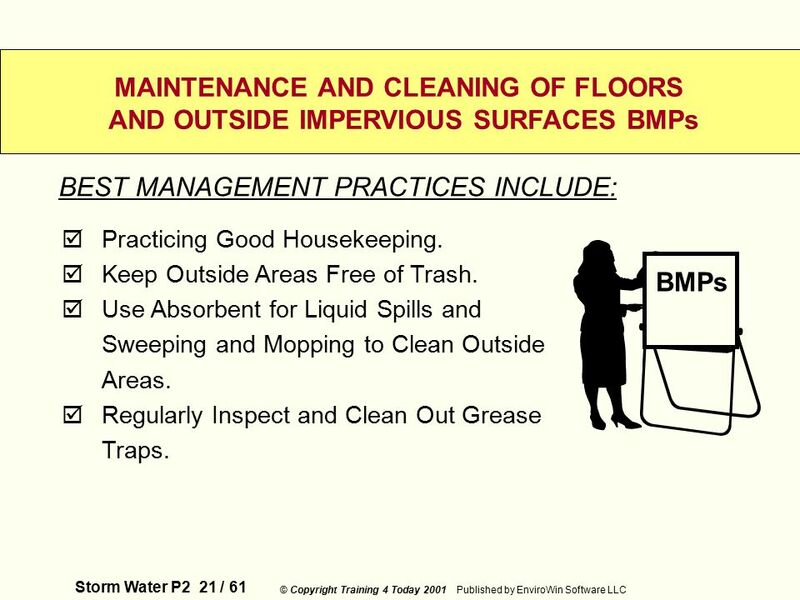 Session 6 Outline Overview of program requirements. 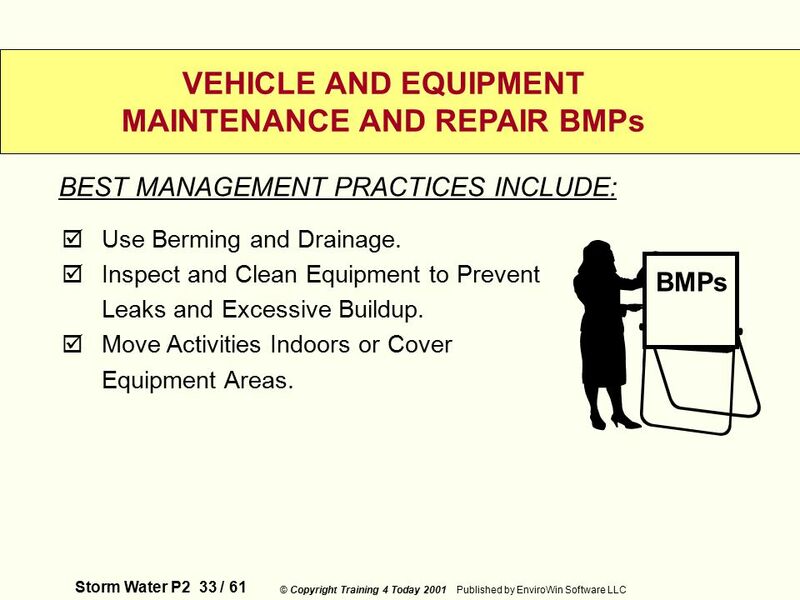 Defining your program. 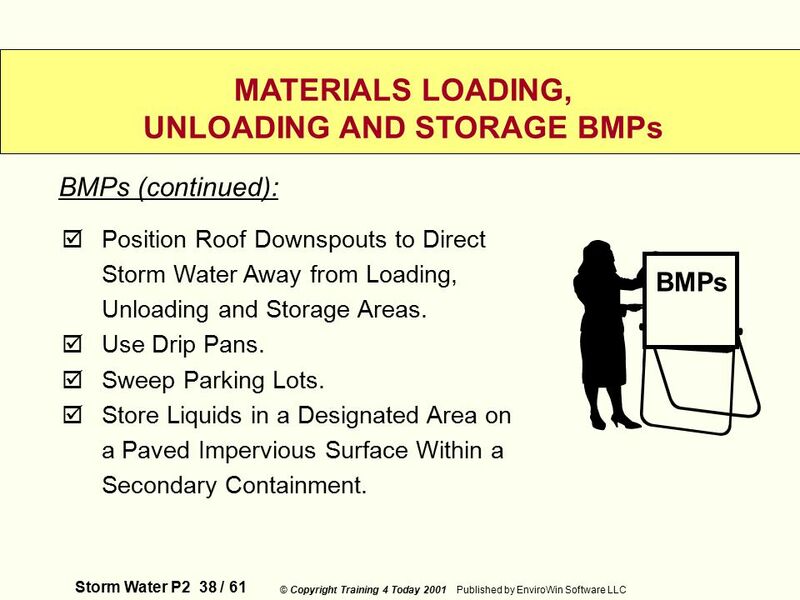 Program components. 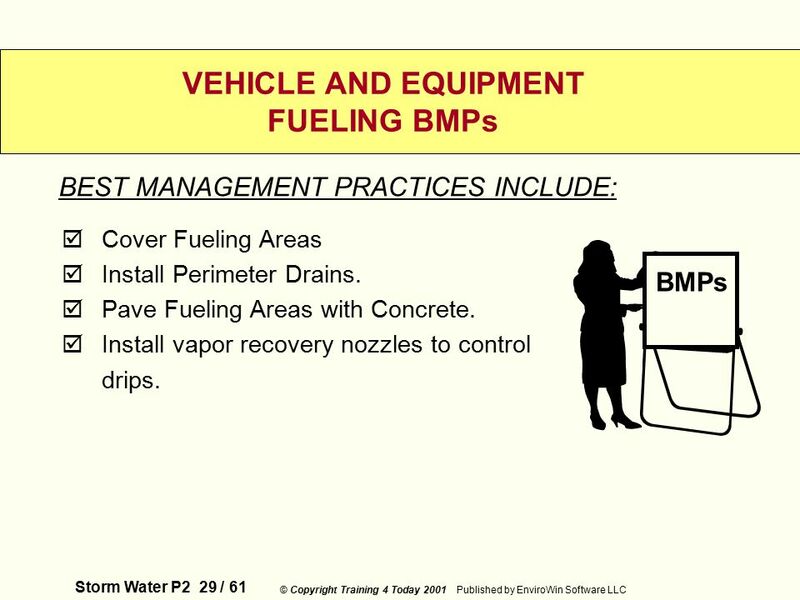 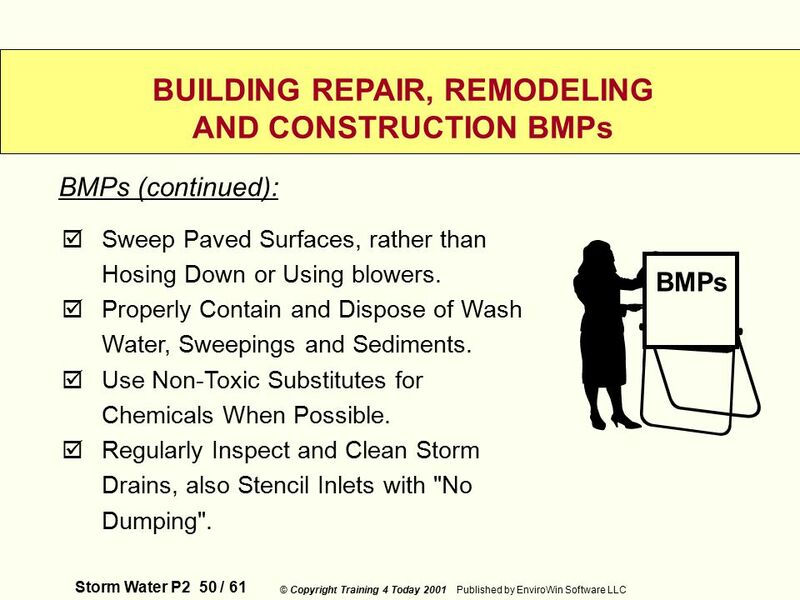 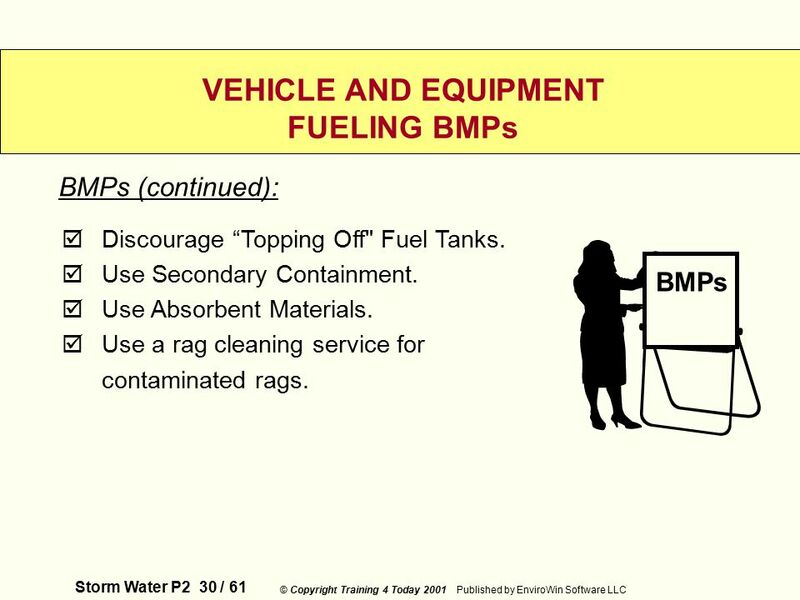 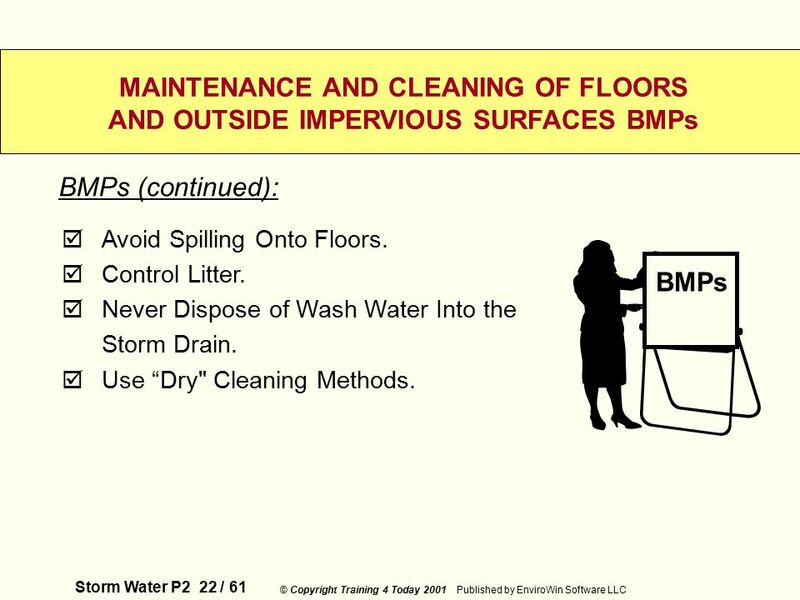 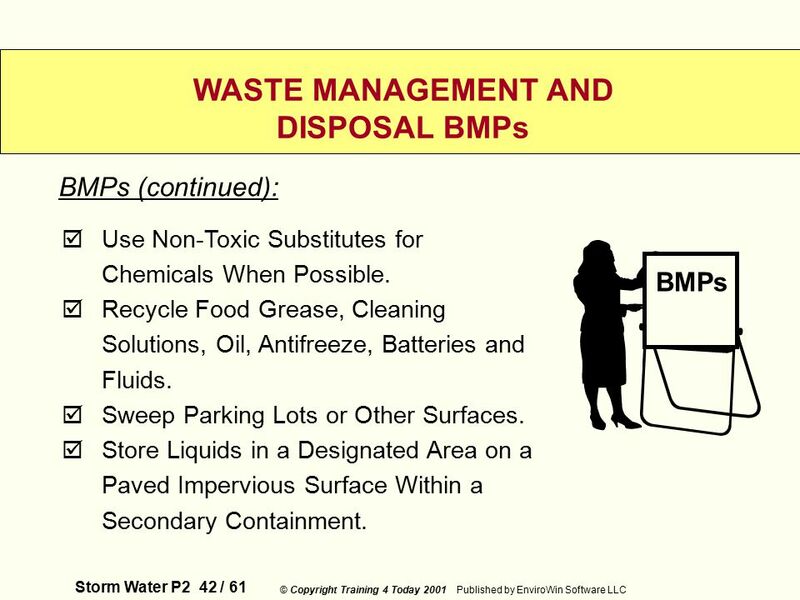 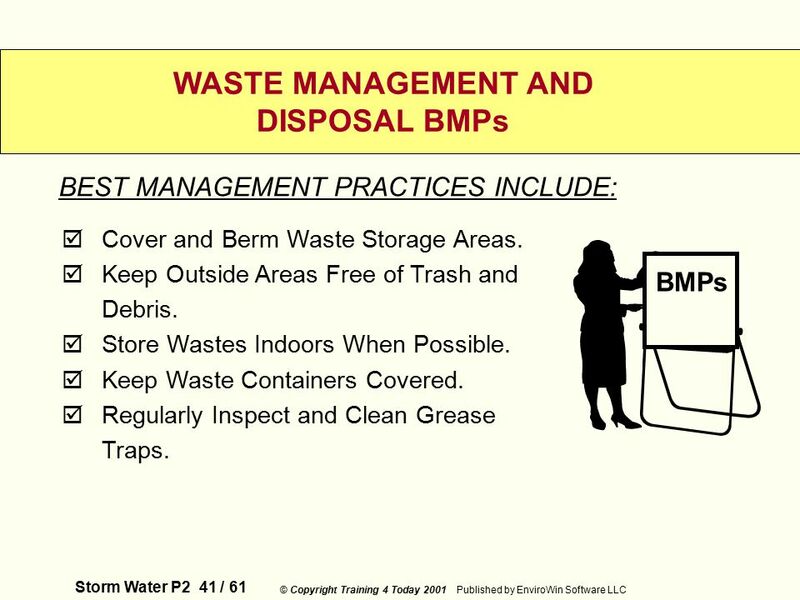 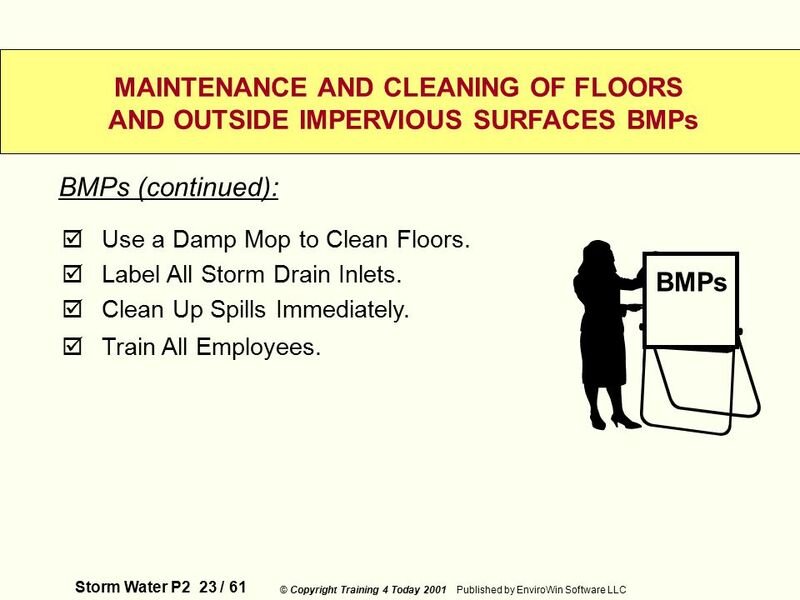 Overview of BMPs. 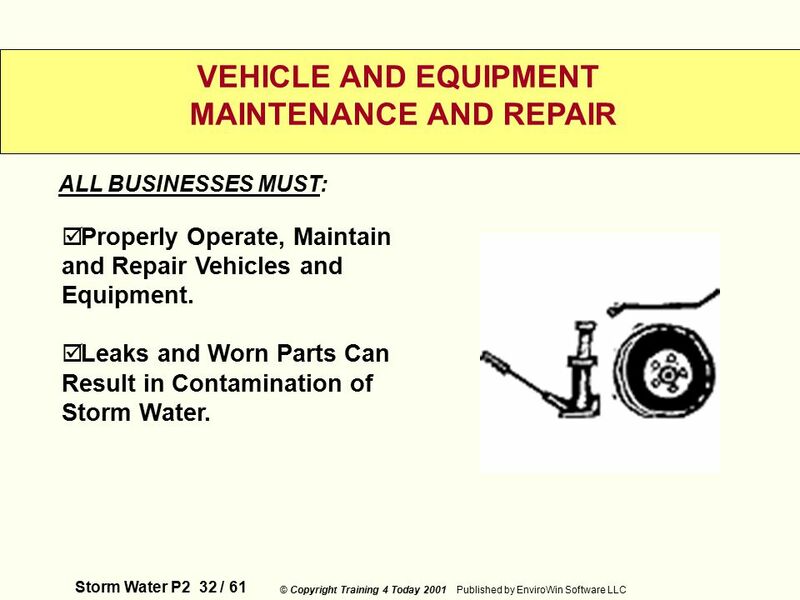 Maintenance inspection. 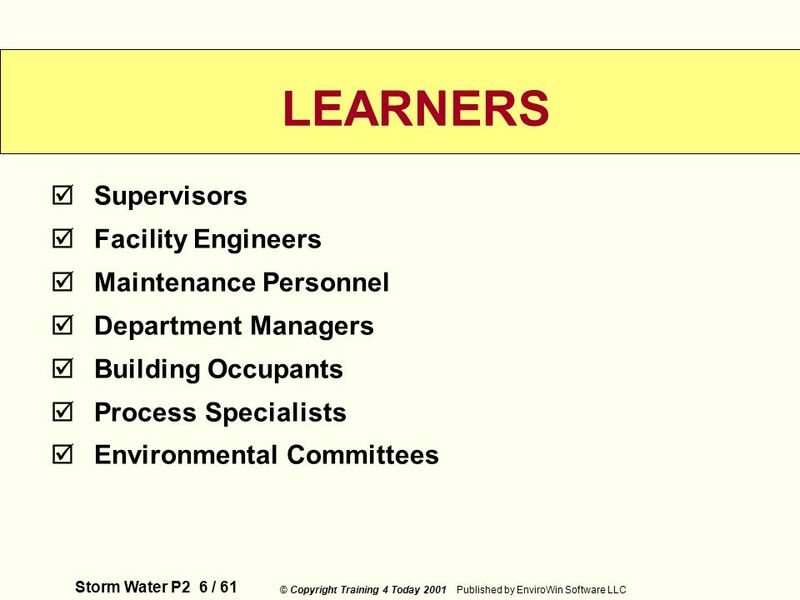 Employee education. 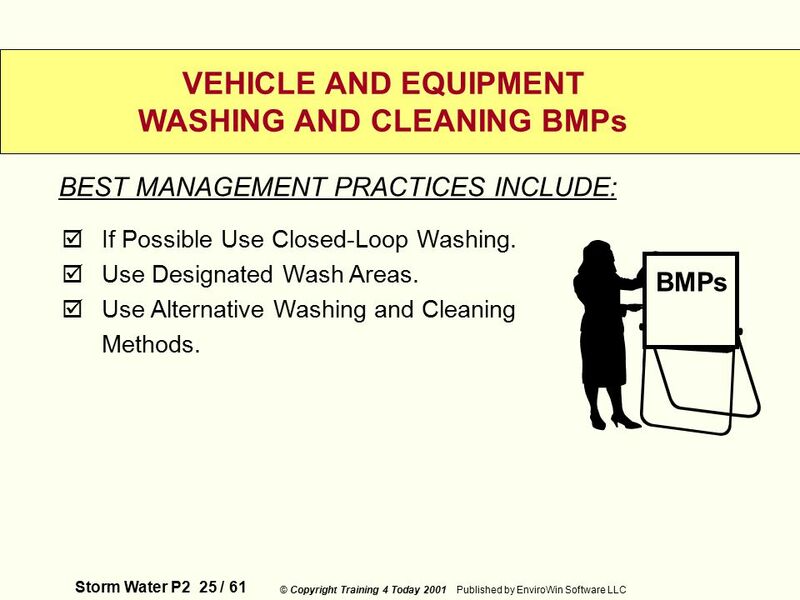 Major Sources of Nonpoint Source (NPS) Pollution and Best Management Practices (BMPs) By: David Wojnowski, Stream Watch/Project WET Coordinator Stream. City of El Cajon Storm Water Group Julie Hampel Bob Griswold Jaime Campos Jason Mooney Dennis Davies Gary Scott & Inspectors. 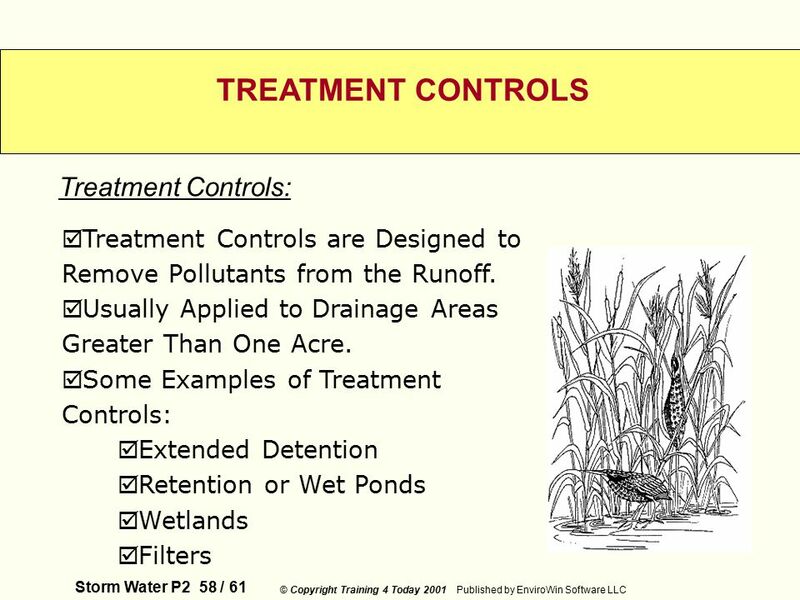 STORM WATER AWARENESS Eastern Virginia Medical School. 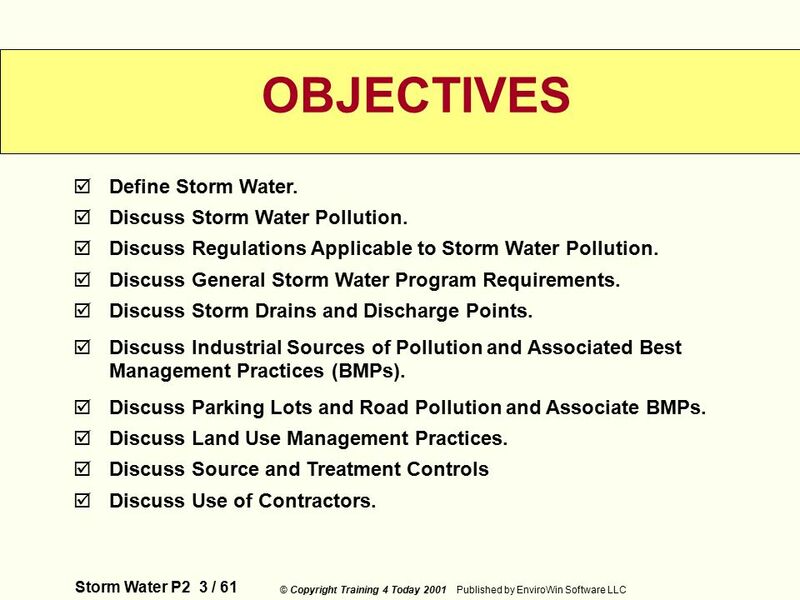 Preventing Storm Water Pollution: What We Can Do Question and Answer Game PREPARED IN COOPERATION WITH THE Texas Commission on Environmental Quality AND. 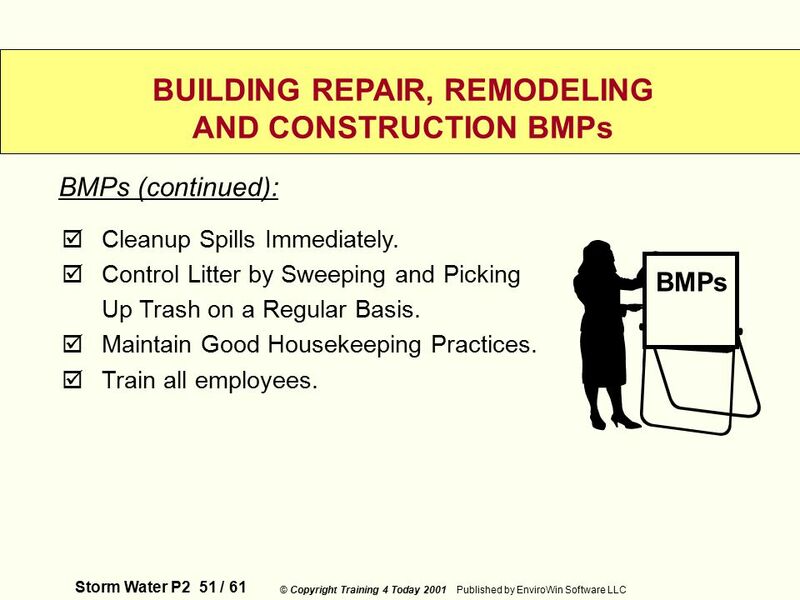 4/27/2015 Licking County Engineer’s Office MCM#6 Training MCM#6 – Pollution Prevention/Good Housekeeping for Municipal Operations Licking County & Partners. 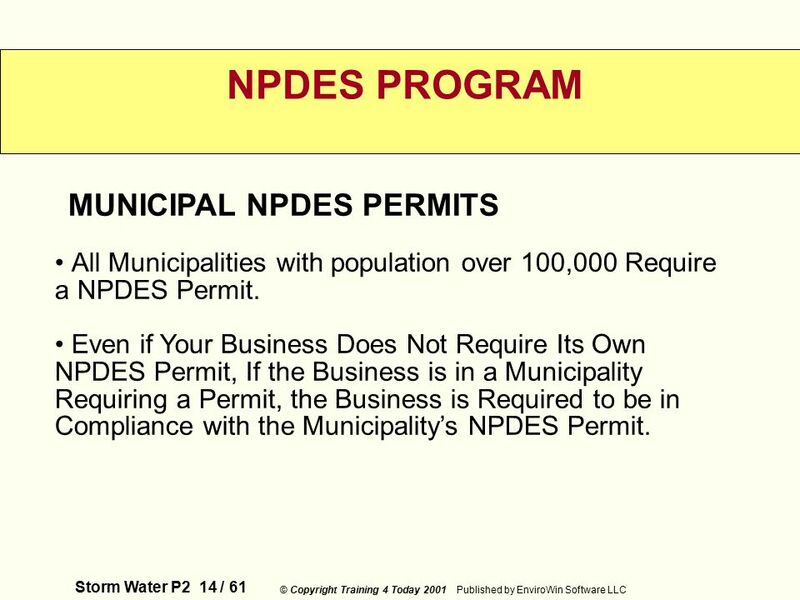 1 NPDES Stormwater Pollution Prevention Presentation May 20,2008. 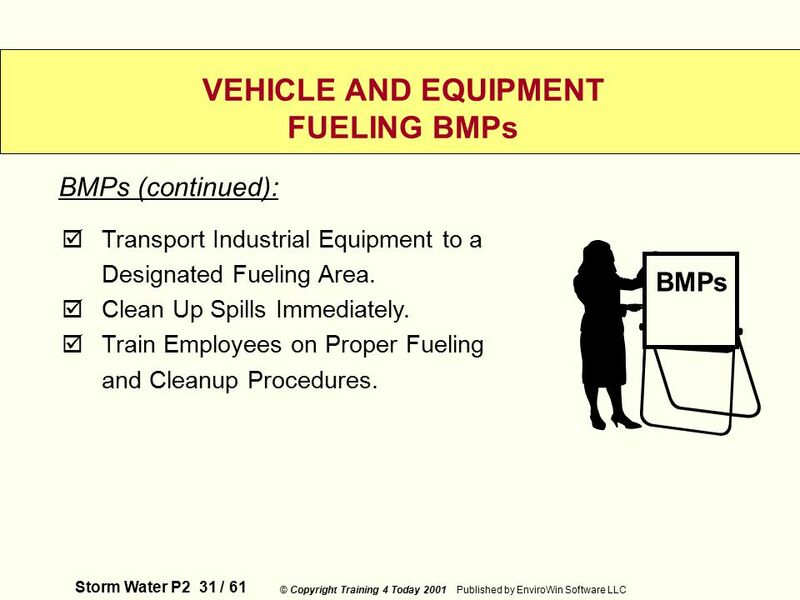 Used Oil and Oily Wastes 4-1(a) Activities That Produce Used Oil n Routine oil changes or repairs n Oily parts drip when placed on the floor or are carried. 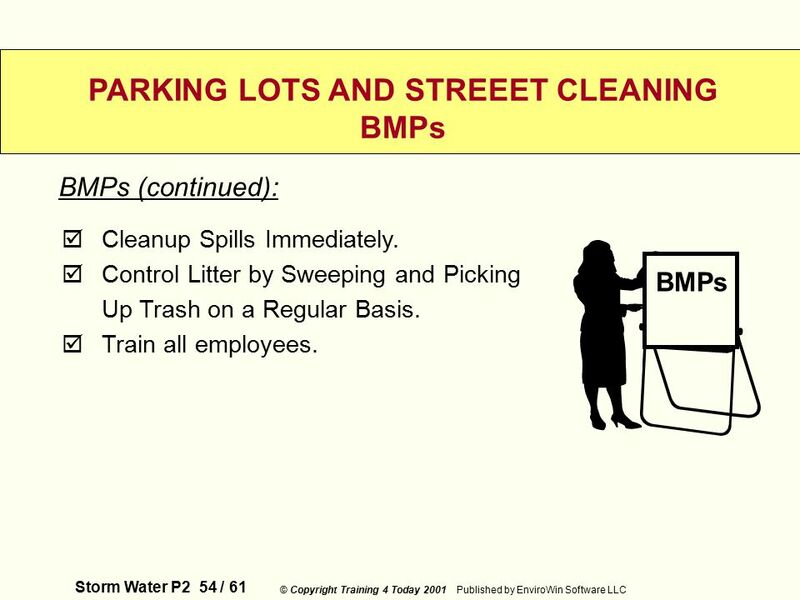 Preventing Storm Water Pollution: What We Can Do ~Employee Training Series~ Fleet Maintenance PREPARED IN COOPERATION WITH THE Texas Commission on Environmental. 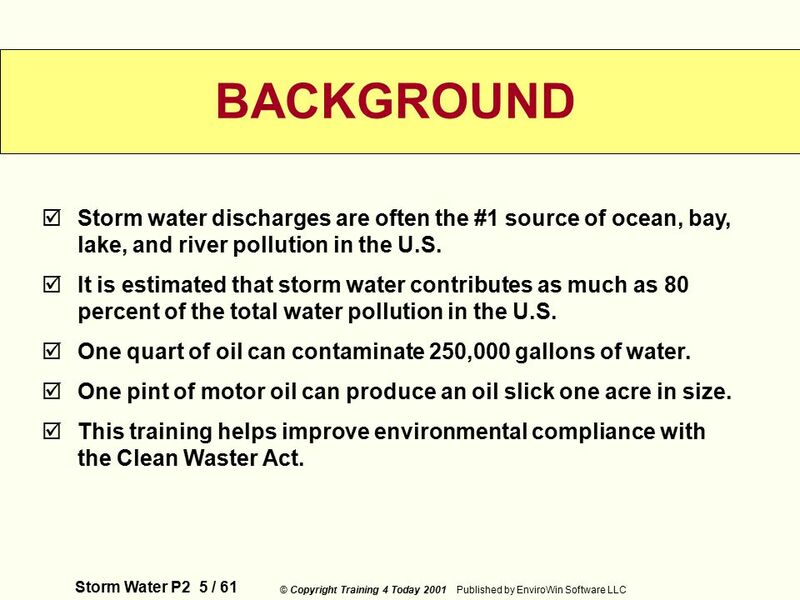 Let’s Pick our Storm Survivor Teams… Team 1 – DucksTeam 1 – Ducks Team 2 - WhalesTeam 2 - Whales. Stormwater Runs to Local Waterways Untreated Turkey CreekKansas River & Missouri River Merge. 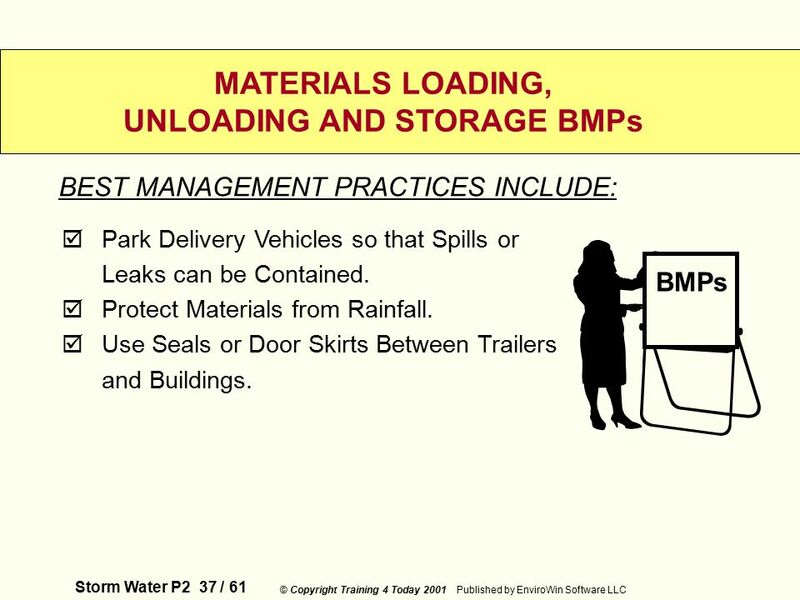 When It Rains, It Drains An Overview of Pennsylvania’s New Storm Water Management Program. 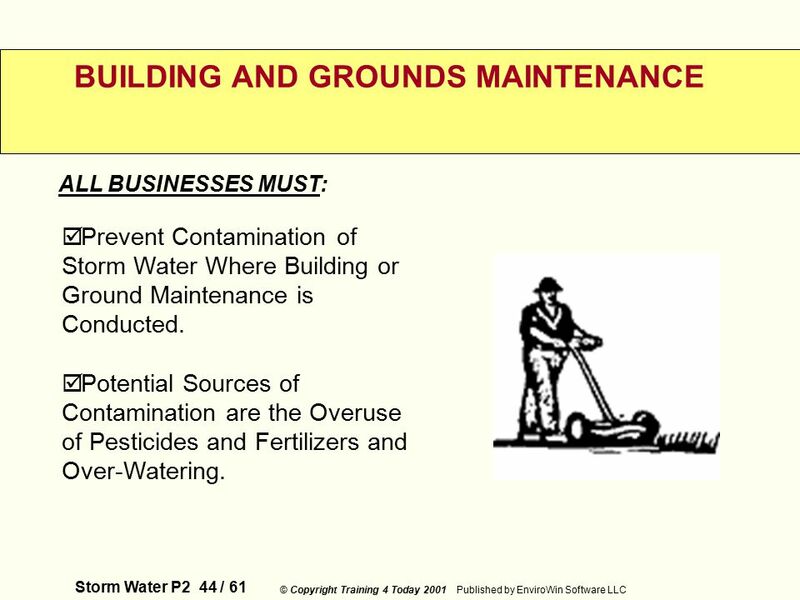 Stormwater, Wellhead Protection and Drainage Issues Public Hearing. 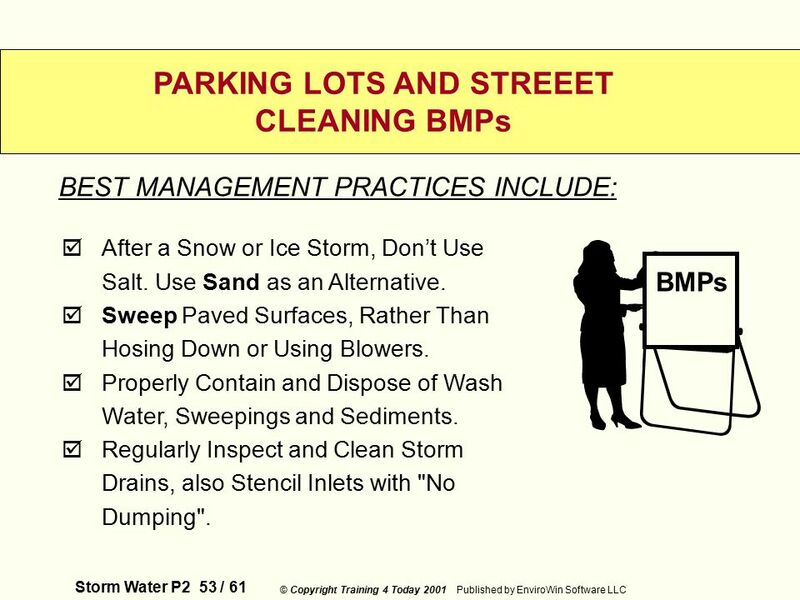 Stormwater Management 1.Reducing pollutants in runoff Pesticides and chemicals Pet and animal wastes Automotive wastes Winter salts and deicers Grass. 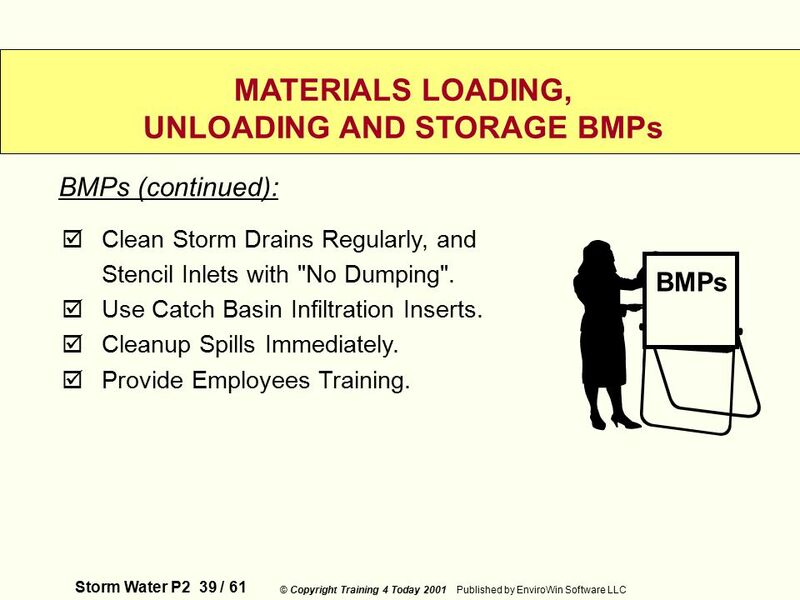 Preventing Storm Water Pollution: What We Can Do ~Employee Training Series~ Solid Waste Operations PREPARED IN COOPERATION WITH THE Texas Commission on. 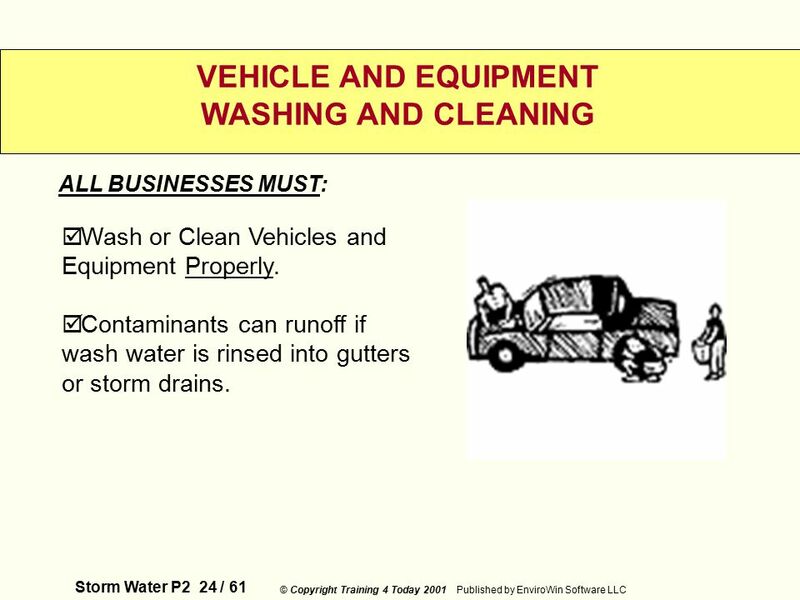  DO NOT pick up liquid wastes such as:  used motor oil  paint  antifreeze  cooling liquids  cooking oil  Check vehicle frequently for leaking fluids.